I didn't plan to go to New Zealand, but because there was no direct connection from Tahiti to Fiji, I had to make a connection in Aukland. At first I wanted to leave on the same day, but after realizing, that I only had 55 minutes to change planes, I got cold feet and asked my travel agent to rebook the flight to Fiji for the next day. And that is how I ended up spending 25 hours in Aukland. What might seem like an inconvenience turned out to be a good thing, because this gave me the opportunity to do some last minute scuba dive equipment shopping, especially a new wristband for my dive computer which threatened to fall off. And between shopping, sight-seeing, geocaching and meeting up with a friend I made in Galapagos, the time passed very quickly. 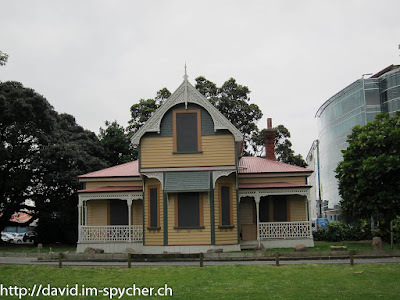 I enjoyed my short stop in Aukland and am looking forward to visiting New Zealand in greater detail in the future :). A few pictures can be found in my web album.